Inspiring story. The Japanese people have very deep connections to the land, which farmers have maintained. This is one of the greatest tragedies of the Fukushima disaster — the disruption of the thousands years old relationship, and the dislocation of an ancient people from their ancestral lands. Some families have at least one relative who’s either odd or eccentric. Others boast family members of a more unusual kind. That’s what one filmmaker discovered in 2011 when he heard of a group of former farmers in Fukushima‘s nuclear exclusion zone, fighting to keep their radiation-affected cows alive, though they brought them no profit. “The farmers think of these cows as family. They know that these cows can’t be sold, but they don’t want to kill them just because they’re not worth anything,” Tamotsu Matsubara, who made a film called ‘Nuclear Cattle’ (Hibaku Ushi) on their plight, told CNN. It costs around 2,000 dollars to maintain each cow for a year. 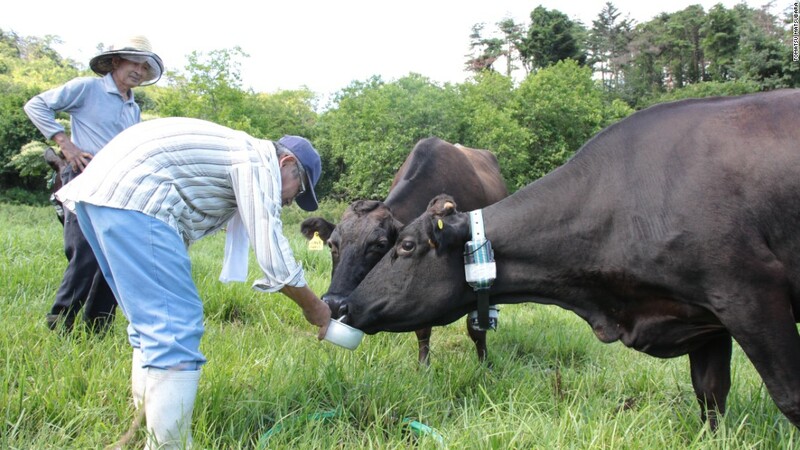 The farmers featured in Matsubara’s film are among those who refused to obey the Japanese government’s initial requests to euthanize cows in the exclusion zone. “[These farmers] really want them to serve a greater purpose for humans and for science,” explained Matsubara. On March 11 2011, a 15-meter tsunami triggered by a 8.9-magnitude earthquake, disabled the Fukushima Daiichi nuclear power plant in Fukushima, causing a nuclear accident. Residents within a 20 km radius of the facility were forced to evacuate their homes and leave behind their livelihoods and possessions. Before leaving, some farmers released their cows so they could roam free and survive in the nuclear fallout-affected area. 1,400, however, died from starvation, while the government euthanized 1,500 more. Since 2011, Matsubara has documented both the relationship six farmers have with their surviving herds as well as an ongoing study examining the effects radiation has on large mammals. The farmers — who return two or three times a week to their former farms — initially kept their cows alive just out of love. But since 2013, Keiji Okada, an animal science expert at Iwate University, has been carrying out tests on them. Okada established the Society for Animal Refugee & Environment post-Nuclear Disaster, a non-profit with researchers from Kitazato, Tohoku and Tokyo university. The researchers are funded through their universities, and say their project is the first to look into the effects of radiation on large animals. “Large mammals are different to bugs and small birds, the genes affected by radiation exposure can repair more easily that it’s hard to see the effects of radiation,” Okada, told CNN. “We really need to know what levels of radiation have a dangerous effect on large mammals and what levels don’t,” he added. So far, the cows living within the exclusion zone haven’t shown signs of leukemia or cancer — two diseases usually associated with high levels of radiation exposure. Some, however, have white spots on their hides. Their human minders suspect that these are the side-effects of radiation exposure. As Japan continues to confront its nuclear past, present and future, Okada said his group’s study would keep the country prepared in the event of another disaster. “We need to know what levels of radiation are safe and dangerous for large mammals, and have that data ready so that the euthanization of livestock can be kept to the minimum,” added Okada. Elderly farmers feeds their radiation-affected cows in the exclusion zone. Since 2011, the Japanese government has taken measures to decontaminate radiation-affected zones within Fukushima by stripping surface soil from contaminated zones and by cleansing asphalt roads and playgrounds. Evacuation notices have also lifted on some towns in Fukushima. Taichi Goto, a spokesperson from the Ministry of the Environment’s Office for Decontamination told CNN that Namie, a town currently in the exclusion zone, was scheduled to be decontaminated by March 2017. Yet critics point that the state’s measures still aren’t enough. Matsubara acknowledged the government’s decontamination work but asserted that it was impossible for them to clear the mountainous areas west of the exclusion zone. While some farmers have slowly started to rebuild their lives by starting new businesses in decontaminated areas in Fukushima, the campaign to keep alive irradiated cows within the exclusion zone continues. “These cows are the witnesses of the nuclear accident,” Masami Yoshikawa, who lives in Namie town in the heart of the exclusion zone, states in Nuclear Cattle.